In Ticket to Ride Asia - the first in a new series of Ticket to Ride expansions featuring two different maps on a single, double-sided board. You`ll embark on an incredible adventure in Alan R. Moon`s Team Asia map as you and a partner compete against other teams on a 25,000 km wild ride from Kabul to Beijing, through the steppes of Mongolia and the Gobi desert up to the Yellow River! Or, travel alone along the Silk Road or the hustle and bustle of Indochina as you venture into Legendary Asia. 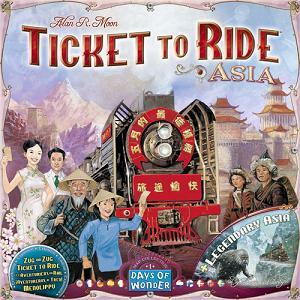 In addition to the two maps, Destination Tickets, and Rules booklet, Ticket to Ride Asia also includes six wooden cardholders, plus an additional 45 plastic trains (nine each of each of the five standard colors), both of which are used for team play. Ticket to Ride or Ticket to Ride: Europe is required to use the maps in this expansion.